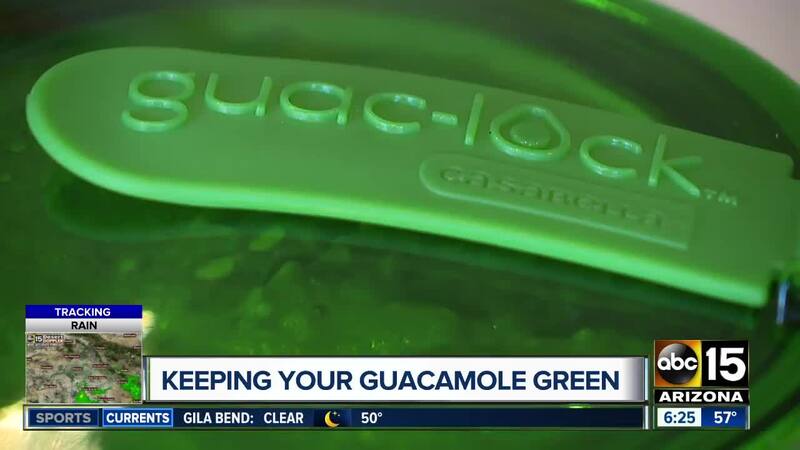 Will the Guac Lock keep your guacamole from turning brown? How do you like your guacamole? I'm sure brown is not on your wish list. So we bought the Guac Lock for about $16 to keep your guacamole fresh, green and ready to eat longer. But will it work? The claim is that the container sits on a base that removes oxygen with a push and that is supposed to create an airtight seal to keep the avocados from turning brown. It's supposed to work with other dips, like hummus, too. But we're sticking with guacamole! The process seems simple… Fill the container, then snap the lid shut, leaving the center open. Then use the elevator to push out the air. Finally close the lid and you're ready to go! We made a big bowl of guacamole and put equal parts in the Guac Lock, a regular container and I read if you add a little lime juice and cover the bowl with plastic wrap, that will preserve your guac as well. So we let all three containers sit in the refrigerator, side by side for one week. We checked the guac daily and even after a full week, all three methods look very similar. So how does it rank on our Bull/No Bull meter? I'm going with Bull, because it really didn't give us any extra days of freshness. In fact, our DIY method with the lime looks just a little greener than the other methods. How do you preserve your guac? Email me at smartshopper@abc15.com .